MSc Al.I.Cuza 2000, computer science; PhD Geneva 2008, linguistics. 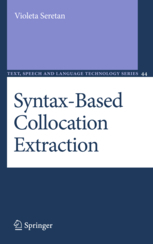 My monograph Syntax-Based Collocation Extraction is based on my doctoral research. Full texts and BibTeX entries for all my peer-reviewed publications can be found here.